View of Shanghai's Pudong skyline from the Bund. Looks like you are almost ready for life in the big city of Shanghai! Now comes the part you’ve been waiting for–what you should do for fun in and around Shanghai! Before you get started journeying around one of the most exciting cities you’ll ever be to, there are some tools that might make your travels a little easier. There are two applications I would recommend downloading if you have a smart phone or similar electronic device: Hi Shanghai and Google Translate. Hi Shanghai is a complete and regularly updated collection of just about everything you could possibly do and everywhere you could possibly go in Shanghai. It includes over 3,000 restaurants, 1,000 shopping locations, and 170 public venues. Best of all, it includes the location of the attraction on a map, and the address in Chinese. Just show your phone to a taxi driver with the Chinese address and you’re good to go. The application information is saved on your phone, so you can download the application using wifi and use it anywhere, even if you don’t have internet or a data plan! Google Translate can also help you out when you get into sticky situations. If you don’t know Chinese and the person you need to communicate with doesn’t speak English, this application can be a lifesaver. Just type in what you want to say, and it will quickly translate it into Chinese. It displays the translation in simplified and traditional Chinese characters, and even has the option for the translation to be spoken. Unlike Hi Shanghai, this does require an internet connection. However, both applications are 100% free, and can be lifesavers. So now that you know that, there are a couple of locations you just have to visit while you’re in Shanghai. 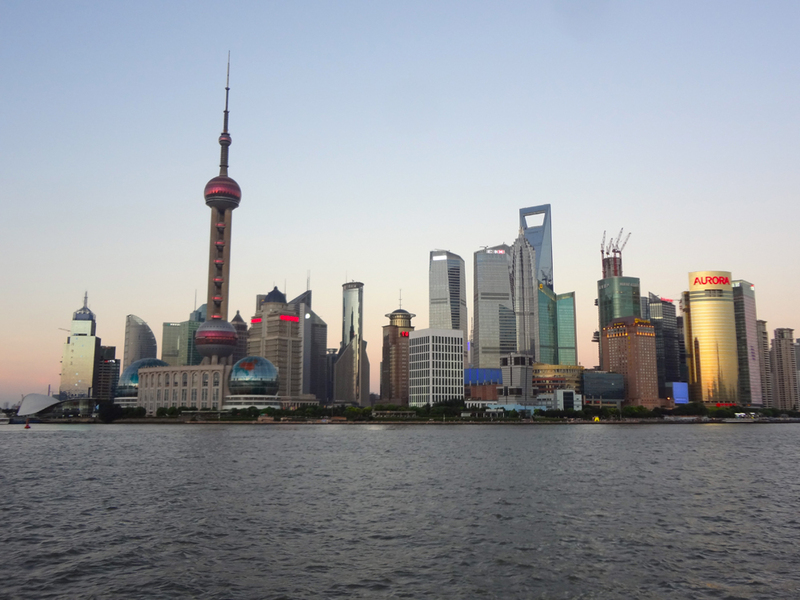 The first, and probably the most famous attraction in Shanghai is the Pudong Skyline. It’s what you think of when you think of Shanghai. It a beautifully modern city built up on an artificially-constructed bluff above a river over the last fifteen years. The Shanghai World Financial Center (popularly referred to as “The Bottle-Opener” based on its appearance) is allegedly the world’s fourth tallest building, and the tallest building in mainland China, for now (construction is already underway for an even taller building right next to it!). There are two ways to view Pudong: from the Bund on the other side of the river, and from the Oriental Pearl Tower, Shanghai’s most recognizable landmark. Either way you can’t go wrong–just make sure to bring your camera, you’re not going to want to pass up these pictures! Just type the keywords into Hi Shanghai and get a taxi to take you there. 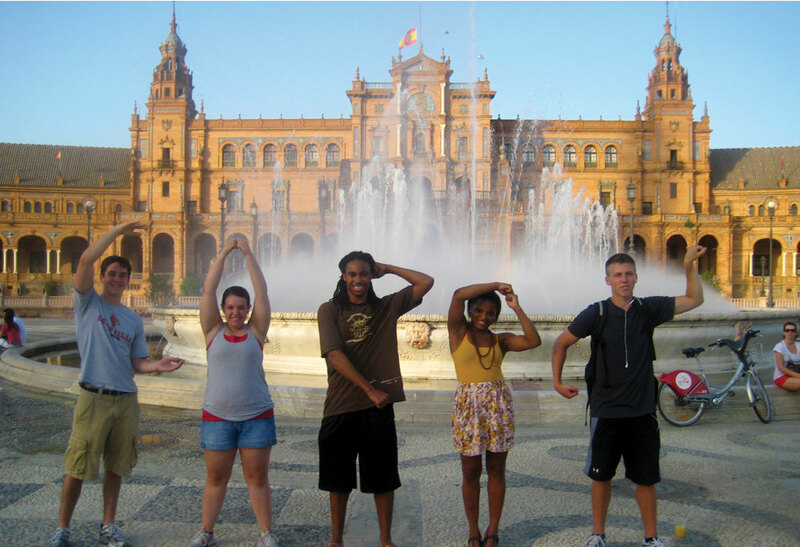 There are a couple other destinations in Shanghai you might want to visit. Shanghai is famous for the Yueyang Garden, which proved to me to be a misnomer–it’s actually a huge marketplace with an attached garden! It’s a perfect place to go for your souvenir shopping, and the garden actually presents a very quaint look at olden times China. It’s a fun getaway from the hustle and bustle of the big city, and proved to be a good day trip for me and my friends. For the more adventurous, there are two day/weekend trips I would recommend. I was in China for two months, so I had enough time to research different locations we could travel a little farther to. The first is the river city of Suzhou, the Venice of Asia. You can enjoy boat rides through narrow canals and tour a number of other famous scenic spots. It’s only about an hour and a half away from Shanghai by train, and demonstrates one of China’s smaller cities experiencing explosive growth. 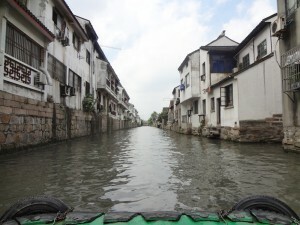 The view from one of Suzhou's famous canals. 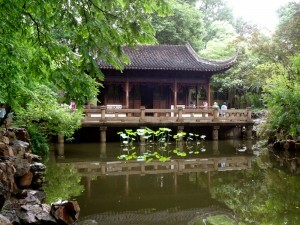 My second recommendation is the lake city of Hangzhou, and the nearby mountainous Moganshan. 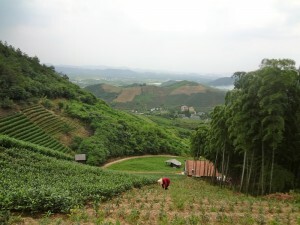 The latter shows a more rural view of China complete with authentic villages and tea plantations. After some time in the fast-paced city, a weekend in the mountains is a scenic and relaxing break. For the daring adventurers in your group, there are breathtaking mountain views for those willing to hike in the heat! The view of Moganshan from a mountainous tea plantation. This survival guide could not be complete without my final recommendation: Beijing! This northern city is the cultural and political capital of China, and is famous for Tiananmen Square, the Forbidden City, and its proximity to the Great Wall of China–all of which I suggest visiting. As I mentioned before, it’s about 555 RMB (close to $100) to get there (and about the same to get back to Shanghai), but it’s worth it. You can’t leave China without seeing its world wonder. Even though I was only in Shanghai for a couple of months, I could definitely tell a cultural difference between the two cities. I encourage you to check it out and make up your mind for yourself. Just make sure to budget yourself enough time in Beijing–my friends and I spent about three days/two nights in Beijing, and barely had enough time to see everything we wanted to. Although it’s convenient to fit into three-day weekends, you might want to take a day off work or miss a day of class (shh… I won’t tell!) to do the Great Wall of China and some of the other sites China is most famous for. It’ll be worth it in the long run! Me and some of my friends proudly on the Great Wall of China! And with that, I have bestowed upon you about as much information in as short of time as possible. I am confident that you are going to make your own set of memories and friends, and I hope someday soon you will be able to upload your own survival guide. I loved my time in China, the people I met there, and the wonderful memories we made together. Go into China with an open mind and an open heart, and I can promise you that you won’t regret it.